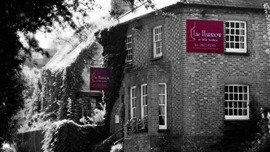 The Woodspeen Restaurant launched in November 2013 on the former site of the Five Bells pub in the rural Berkshire, just a short drive from the historic market town of Newbury. It is the first solo venture from acclaimed chef John Campbell, who earned two Michelin stars during his tenure at the Vineyard at Stockcross. The 19th century property has undergone extensive refurbishment while preserving the historic character of the building. An extension to the building has been built to the rear of the pub to house the restaurant, which features an open plan kitchen and floor to ceiling glass panels to take in the glorious countryside views. Campbell's cooking is built around top-quality raw materials sourced from the restaurant's own garden and trusted local producers and suppliers. Typical offerings on the carte include cured and tartare of Cornish mackerel and pickled radish or meat fans will enjoy the confit duck, liver parfait, soused cherries. When it comes to main courses there's Berkshire partridge, lentil and mushroom pie paired with bread sauce or Halibut, chervil and artichoke barley risotto, and sprout tops. To finish there are a selection of enticing desserts in the shape of rice pudding, baked pineapple cinnamon doughnuts or pear tatin, blue cheese and muscatel ice cream. Located across the road in a converted barn is the cookery school, which offers a variety of courses for people of all cooking abilities. The facility will also be used to run workshops for local schools and for charitable ventures. The restaurant was awarded a prestigious Michelin star in the 2016 edition of the Guide. Originally known as the Harrow Inn, this unostentatious Wiltshire hostelry has been impressively transformed by Roger and Sue Jones, who have turned it into a fully-fledged country restaurant famed for its remarkable wine cellar and top-flight, seriously accomplished cooking.